Mat Martin specializes in legal search and placement of associates, counsel, and partners in the Chicago and Midwest market. With his deep understanding of the dynamics at play in the legal marketplace and knowledge of national trends, Mat provides valuable information and thoughtful feedback when consulting his clients and attorney candidates. Mat joined Mestel & Company in 2018. 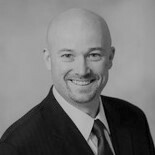 He brings nearly 12 years of experience in legal recruiting and an additional 7 years in the practice of bankruptcy law. As a former attorney at several Chicago area law firms, and as a legal recruiter, Mat has developed exceptionally strong relationships within the legal community, which he will continue to leverage as he positions his clients and candidates for success in their career and legal talent management strategies. Mat earned his J.D. from the University of Iowa College of Law and his B.A. in History and Political Science from Colorado College. Mat enjoys his free time coaching, reading books, cooking for family and friends, and keeping up with his two young sons.